Whew! Let me start out by saying I had way too much Black Death tonight. So, you have to give me more leeway than usual for typos and such (giggling). What a day! I am so tired I can’t see straight. We pulled out of Chistochina this AM to a gorgeous day and a gorgeous ride. I stopped to take a picture at the boundary of Wrangell- St. Elias National Park and Preserve. 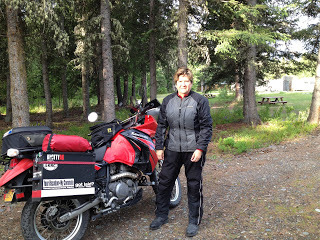 Then we headed into Tok for a brief gas stop. The whole time we pushed ourselves because we didn’t know what the day was going to be like. The mileage for the day was not that long (280 miles), but there was a lot of dirt. We were worried if the weather went bad it would be a very long day. We wanted to stay ahead of the game. Dust was thick in the air and I had dirt in places dirt should not be! Later when I took a shower at the B&B, all that dust became a river of mud in the tub! Two things kept passing through my thoughts today: flowers and potholes. Lupine were everywhere and the air was saturated with the smell of wildflowers. Potholes, they were everywhere too! I especially loved zigging and zagging around them. There were lots of dual sports on the road. Dual sport riders are a different breed. 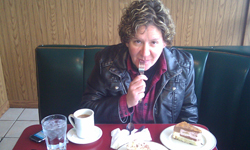 We generally travel alone or in very small groups. We don’t like crowds, rallies, or big cities. For this reason, it is rare to see so many peeps on dual sports in one place at one time; D2D is an exception for Alaskan and Canadian riders. A small number of lower 48’ers show up, but it’s still a local event. Today I spent some time rubbernecking at all the dual sports. Holding true to their taste, they trickled into Dawson all day, one or two at a time. The big dinner is Friday. Because I’m not a big crowd person, we are going to head out Friday morning. 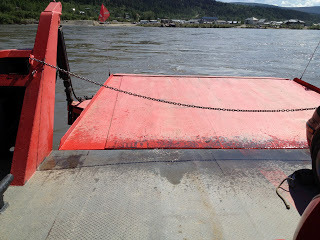 When we reached the end of the road (literally), we boarded a ferry to cross the mighty Yukon. I really like this river. I have spent a lot of time getting to know this river and I think we are on an intimate basis! The Yukon is nearly 2000 miles long. I have crossed it countless times, I have canoed it for 11 days, and I have fallen into it in Eagle. I have read about it, and I have dreamed about pedaling here entire length in the dead of winter. Today, I crossed her again by ferry boat. We chuckled at Zumo trickster GPS of the Raven clan. 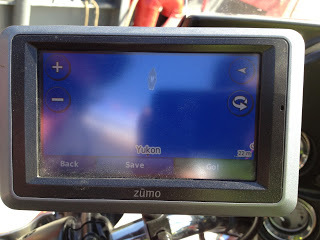 Zumo had us riding our motorcycles across the Yukon river because apparently we tread water. At the end of that ferry stood Klondike Kate with the coveted Black Death… enuff said! 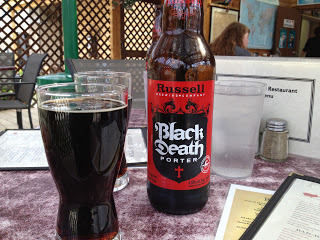 Mud & Black Death … sounds like a good day!